The Part Time Gourmet: Buying Coconuts? Here are some tips. I don't think I've ever actually purchased coconuts in a store. Out East here, I haven't come across much use for them, but when the time comes that I branch out and try using them as part of a recipe or something, I'm not sure how I would know which one was a good one. Coconuts are available year-round. 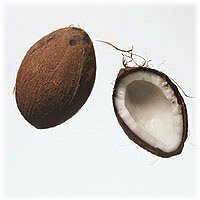 Although coconuts in their brown, hairy shells are the most familiar to shoppers, young coconuts without shells are becoming more frequently available in supermarket produce sections and specialty markets. To find the freshest fruit, hold and shake coconuts; choose those that are heavy and sloshing with juice. Store unshelled coconuts at room temperature for up to six months. Refrigerate grated fresh coconut meat up to four days, or freeze up to six months. To open shelled coconuts, pierce the soft "eye" spots with an ice pick to drain the juice. Then "tap all around the hard shell with a hammer until it cracks and falls away," Onstad suggests. She also recommends heating the coconut in a 350-degree oven for 30 minutes, "at which point the shell will easily break away."